The AceClamp® family of roof mounting innovations gives you stronger, more flexible mounting options for standing seam metal roofs - without damaging roof surfaces and risking roof warranties. 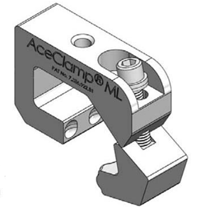 The AceClamp® ML was designed with the contractor in mind. Safety while on the job is the number one priority. All of the attachments are on top of the AceClamp® ML, not hidden on either side where it is hard to reach. The patented two-piece design opens wide to fit all styles of commercial seamed panels.